Posh manager Grant McCann (right) and his assistant Lee Glover. Grant McCann has defended his side’s use of the midfield diamond formation. In fact the Posh boss claims his preferred system is more fluid than most fans (and media) realise. Marcus Maddison should be back in the Posh team at Swindon. 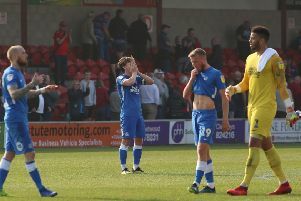 McCann is aware of fan criticism that Posh can be too easy to play against, but he insists results prove otherwise. Losing 5-1 at out-of-form Bury last weekend came as a complete surprise to everyone at the club. “When we stopped playing 4-2-3-1, we lost two of 14 games,” McCann stated. We do line-up in a diamond formation, but it becomes 3-5-2 when we have possession and 4-3-2-1 when we don’t have the ball. “It’s a way of playing I like and it’s one that suits the players we have, but all this talk of formations does become wearing. Recent signing Dominic Ball should be in the Posh squad at Swindon. “As Lee Glover (Posh assistant manager) pointed out this week, it’s players who win games not formations. McCann is determined not to overreact to the biggest League One defeat of the season, but he is likely to make a couple of changes to his starting line-up for Saturday’s trip to Swindon. Marcus Maddison is expected to start after his impressive second-half cameo at Bury. On-loan players Martin Samuelsen and Dominic Ball are also in contention. Defender Ball has recovered from the shoulder injury that kept him away from Gigg Lane. Michael Bostwick has also recovered fully from the bad back that affected his preparation for last weekend’s defeat. No matter what team he picks, McCann is aware Swindon away is a much more difficult fixture than it looked a few weeks ago. “I have watched Swindon’s win at Bolton and they were a completely different team,” McCann warned. “They have signed Ben Gladwin again and he is an excellent player at our level and the three lads they have recruited from Chelsea are all very good players.